8.06 points at 33 votes (rank 73). Towards the end of the Second World War significant artworks from France were stolen and should be brought per train to Berlin. 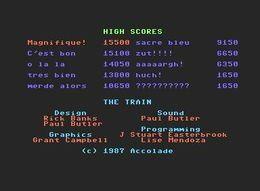 The player in the role of the French oppositioner Pierre Le-Feu has the mission to capture the train together with Le-Feus comrade Le Duc and bring it to the western coast town Rivere. During the game, Le Duc gives tips and information in the footer, as e.g. a too high pressure in the boiler or the distance to the next station. 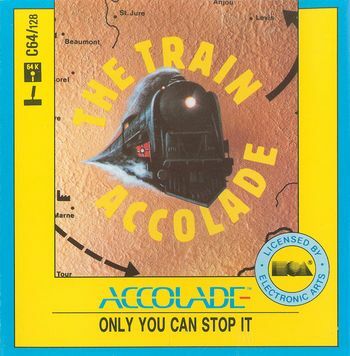 On the way to Rivere, the player has to master different tasks, be it to fend off jet attacks, to sink gunboats and - basically the core of the game - of course operate the train. 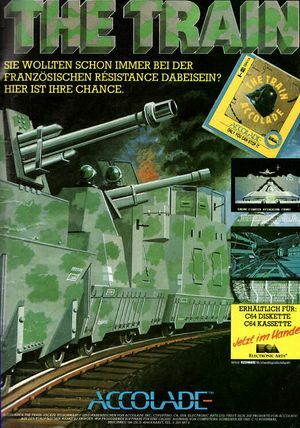 The game starts with the capture of the train. Le-Feu gives suppression fire to his comrade Le Duc (as is well-known French people are always named Le-something), so he can change the points, with which at the same time the difficulty grade is chosen. The German soldiers are generally so friendly as to switch on the light in their room before they shoot. So you should shoot with your MG on the alit windows as fast as possible. Le Duc only walks on when the player shoots. Overtaking hostile stations goes with the same principle. 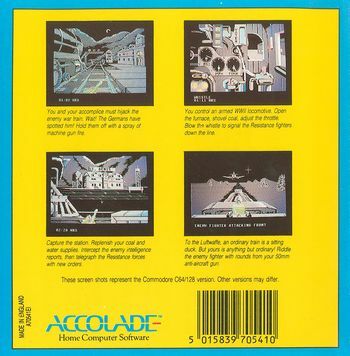 Graphically, the game shows up rather ostentatiously and in detail, whereby one has to remark, however, that it works mainly with static images. During the ride you see very nicely how the snow-covered trees pass the train. If you open the furnace door, the light flickers at the surrounding instruments. On the sound they tinted a bit more. 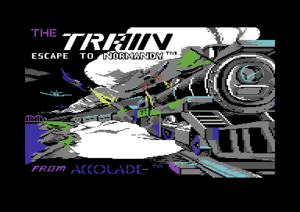 In the title screen a melody sounds, in other respect there is not much more than train sounds and machine guns. 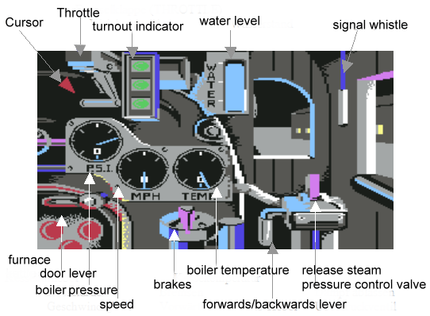 At the upper left you see the throttle. To get faster you draw the lever towards you. To the right there is the display for the points (more detailled explanation see further below). To the right of the points display you see the water level indicator. To the far right, betweeen two windows, there is the lever for the signal pipe, with which you can - next to reviving your train driver dreams - operate the points. Approx. in the middle you see three round displays, which give you information from left to right about the boiler pressure (P.S.I. ), the speed (MPH) and the boiler temperature (TEMP). At the lower left there is the furnace door, which you can open to scoope coals into the oven and by this raise the temperature. Next to the door you find the lever for the brakes, next to that a lever to change between the foward and the rear gear - and which you in any case should NEVER move while the train is in motion. Finally, approx. below the signal pipe you find the pressure control valve, which needs to be operated if the high pressure in the boiler threathens to damage the boiler. The names of the single controls are shown if you move the cursor on them. You start the game be pressing the fire button. Now you are on the station in Metz. 3.) Cover fire: Now you have to go on with giving Pierre cover fire until he has climbed into the locomotive. The mission starts. NEVER move this lever while the train is in motion !! The ratfinks from the air force attack the train! With the keys 1 and 2 you switch between front and rear machine gun. The joystick moves the crosshairs, with fire you err, fire. If the caliber .50 hits a plane, it will explode. If too many hostile shots hit the train it will break down. Life can be that easy. If a bridge is in the enemy's hands, one has to convince the German cannon boats to clear the passage. You reach this best by sinking them all. With the joystick you set the angle of your own cannon, with the fire button you fire. Depending on whether the shot was too high or too low, too far to the left or the right, you adjust the cannon a bit better and make the next shot. When all cannon boats are sunk, the topic "bridge" is done and the train can go on. However, the topic "game" is done, if you have taken too many hits from the cannon boats. At the stations your water and coal are automatically refilled. If it is a hostile station, this needs to be captured first, as done at the beginning. Le Duc can view the report in the station building and then decide, whether and which message he wants to send to the allied comrades. For the first two points you need to consider the time window. The bridge or respectively the station must be reached within the given time! Le Duc notifies you, if the trains runs towards a switch. The current switch position can be read from the corresponding display in the driver's cabin. The switches are changed by whistling with the signal pipe. When you press the key "F1" and confirm with "Y" if you are in a hopeless situation, e.g. in a holding siding with damaged gear box. How fast you get through has (apparently) no influence on the score. As cannon boats get more points than guards you should capture as many bridges as possible. However, if you absolve the stations carefully and skillfully you can shoot up to 25 guards (50 pts each), receiving 1250 points. 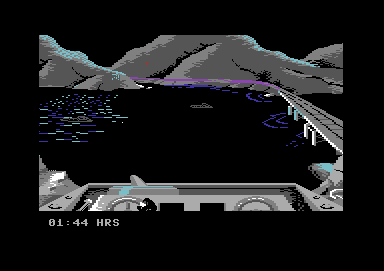 On the other hand, at a bridge there are only 4 boats (250 pts each), yielding 1000 points. Shortly before you reach the final town you should stop the train and drive a lot to an fro to hope for as many air attacks as possible, as shot airplanes get the most points. If you have reached a score of over 20.000 there is a lot you did right. Rockford: "For me in any case a classic. In the old days it was in any case fun to chase with the train through France. But when you reach the point where driving the trains is only routine, there is not much left behind the colour-poor but very good graphics except for a few crosshair games. If the motivation sinks, one can rebuild it with the difficult tracks. 7 points." Robotron2084: "Only three different action sequences are accompanied by sometimes minute-long, eventless driving around through scraggy, grey landscape. A declared trainspotter or railwayman might be happy with this, but not me. However, one has to say that all this was fitted together with the professionality typical for Accolade. Better than Dambusters, but in my opinion it cannot reach Desert Fox, which is truly a pity consideriding the good story, the great graphics and the coherent atmosphere. 6 out of 10 points." mombasajoe: "Optically successful pseudo simulation and movie conversion. The single action scenes are presented appealingly and can be learned fast. In connection to the very fitting soundscape a special - slightly oppressive - atmosphere is created. After two or three fulfilled missions the motivation drops noticeably. Different levels which represent different routes which in turn need a different strategic approach might mitigate this partially (long track needs precision or - if this is not yet manageable by the player - a compromise (suffer damage vs. arriving too late)). 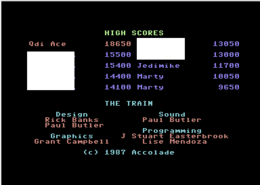 The saveable highscore makes the achievements comparable. 8/10." Shakermaker303: "One can play this on nice long winter days, a fine thing with the snowy landscape in the game :-). One of the better WWII-story-games, is fun again and again. To finally see how the people (in the end screen) cheer for you, indemnifies you for all the strains. So 8/10 points are ok."
This page was last modified on 22 February 2018, at 23:16.